My clearest memory of Bay Gia was when I was six years old. I didn’t know where I was. Grandma had brought us here. I woke to the sound of a fight. A man’s guttural voice bounced off the walls followed by a woman’s high-pitched, unbalanced screaming. Those voices were forever burned into my psyche. I clapped my hands over my ears and rocked back and forth. Where was Grandma? I cowered against the wall of the hut and trembled at the two people trying to rip each other’s heads off and calling one another horrible names. The man was smashing the woman’s head against the wall, pulling her hair out by the roots and kicking her like he might kick a stray dog. I sat up and looked around for Grandma but she was nowhere to be found. Quiet as a mouse, I tried to slide off the bed so the strangers wouldn’t hear me, but the bed was high and I fell to the floor in my rush to find Grandma. I got up. A thin film of material separated our beds from the rest of the room. As I crept around the unfamiliar room in the dark, I stumbled and fell over the hammock that hung across the middle of the house. I bounced onto the rough floor, landing on my face. The floor was covered in dirt as if it had not been swept for years. I cried out for Grandma. Without any warning, a lady with a mean face stood over me. I pretended I didn’t hear her and called for Grandma. The woman grabbed me by the hair and dragged me to my bed, where she dropped me like a rock. My head slammed against the wooden log that served as a pillow. Pain shot through my head and I cried out from the force of the throbbing in my skull. I grumbled and held my head as the woman went back behind the curtain. “Where’s Grandma?” I asked Phuong. “Shhh,” Phuong whispered. Frustrated and scared, she offered to share her log with me. I cried for a little longer while hugging my sister’s log and then we drifted back to sleep. We dozed fitfully while the two psychopaths fought until dawn. In the early morning light I could see that we lay on a rough wooden bed covered with palm leaves. I looked up and saw the morning sky through the many holes in the roof. I sat up, not knowing whether to get up or stay where I was just in case I might run into that nasty woman again. 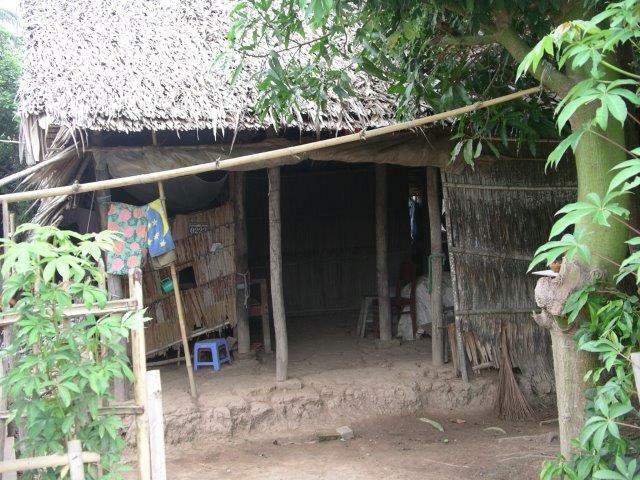 The lousy shack that posed as a house had been built with sticks from coconut and palm leaves. It leaned to one side, one wall held up only by a large timber post that pushed the wall in the opposite direction to keep it stable. It looked as if a strong wind could blow it away. A dirty torn cotton hammock hung right in the middle of the hovel and a filthy mud floor completed the picture. The lady appeared in front of us. She was covered in bruises and her skin was black and blue. One eye was almost swollen shut and the other bloodshot and angry. “Get off the bed, go out to the backyard and get yourselves clean.” She pointed to an unlocked, broken bamboo door. I slowly got down off the bed, stretching my aching limbs. Pushing aside the grimy fabric room divider, I ducked under the hammock and made my way across the room. Another worn, thin curtain hung across the other side of the room. I poked my curious little head through to take a look in this room. Against the wall stood an old tired looking bed, covered with a torn bamboo sheet. A handful of unmatched clothes lay strewn on the floor but the man was not there. I dropped the curtain and continued on, stepping out into a small yard that was so tiny you couldn’t even swing a cat in the space. In one corner of the yard stood three large brown clay containers that dwarfed me by comparison. I stood on my toes to lift off the clay cover and discovered they held water. A faded Chinese plastic water scoop with some pink flowers and a half broken handle floated on top. As I picked the scoop up to get some water and wash my face, strange little black things surged toward the surface. “Oh my God!” I screamed and dropped the scoop on the ground and ran back to the hut as if I was being chased by a ghost. “What’s wrong with you?” the woman with the black and blue body asked. “There are some ugly wriggly things in the water,” I cried, shaking like a leaf. I shook my head in protest. I hesitantly returned to the barrels, picked up the scoop from the ground and frantically splashed a few drops of water on my face, trying not to touch the creepy crawlies. I went back inside. My jaw dropped. What? No toilet? “Use the dry leaves or use your hands,” the woman shouted back. I shuffled around the yard with my pants half-down until I found some rough, dry foliage on the ground. With a grimace I wiped myself as best I could. I washed my hands and I thanked God nobody was watching. Sneaking back past the woman to the bed, I re-joined Phuong and found two little girls sitting next to her. “Grandma told me before she left. Hanh is four and Tien is two,” Phuong said. Phuong nodded and smiled. Hanh glared at us as if she intended to have us for dinner. We played with Tien while Hanh just sat and stared. The woman came inside carrying a small round clay cooking pot with steam spiralling out of it. “Go get some bowls from my room,” she ordered. Phuong and I searched the room. “There are no bowls here,” I called out. We searched all over but couldn’t find anything except an old plastic rack with a few sad looking plastic spoons, several pairs of old chopsticks and some old, brown coconut shells. “There are only coconut shells,” I said to the woman. “Only beggars eat out of these yucky bowls,” I told Phuong. 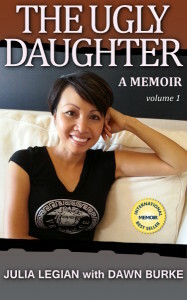 “Shut your big mouth,” Phuong whispered. The lady scooped some watery slop into the bowls. “There’s hardly any rice in here,” I complained. “What do you expect, your Royal Highness? Consider yourself lucky you got that to eat today. Tomorrow you might not get the same.” She turned away and walked out into the yard. “Who is the mean woman?” I asked. “She’s our Mum,” Phuong replied. I zipped my lips and started eating, not daring to say another word. I waited and watched for Grandma to come however I didn’t know how long the wait would be. She would not have abandoned us. She would come, I knew she would. However I didn’t understand then the hell I would go through waiting for her to come back. Previous PostSnatched from the Editor’s desk – PrologueNext PostPublished!